This Park retains its shape and form as originally laid out by Colonel William Light in 1837. 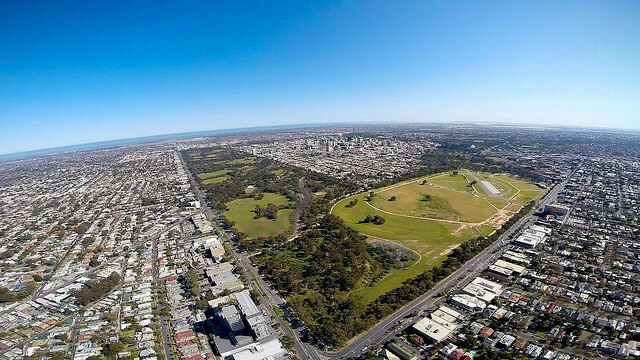 Covering 72 hectares, it represents about 10% of the entire Adelaide Park Lands, the largest single Park within them. Victoria Park/Pakapakanthi is bounded by Wakefield Road, Fullarton Road, Greenhill Road, East Terrace and Beaumont Road. Its two neighbouring parks are King Rodney Park/Ityamai-Itpina (Park 15) to the north; and Carriageway Park/Tuthangga (Park 17) to the west. Victoria Park’s history and development is linked to the horse racing and motor racing events which have dominated its use. However, there are also other, less prominent stories here. Since the demise of horse racing here, Pakapakanthi is in a condition of redevelopment, being returned from a state of semi-alienation to a people’s park with a range of things to offer. The Park is so large that it may take more than two hours to cover it all. You can of course, skip parts and return later. We commence on the corner of East Terrace and South Terrace and will come back here after walking a loop of about two and a half kilometres. Adelaide Park Lands Preservation Association, “Pakapakanthi In Context,” Adelaide City Explorer, accessed April 26, 2019, https://adelaidecityexplorer.com.au/items/show/284.